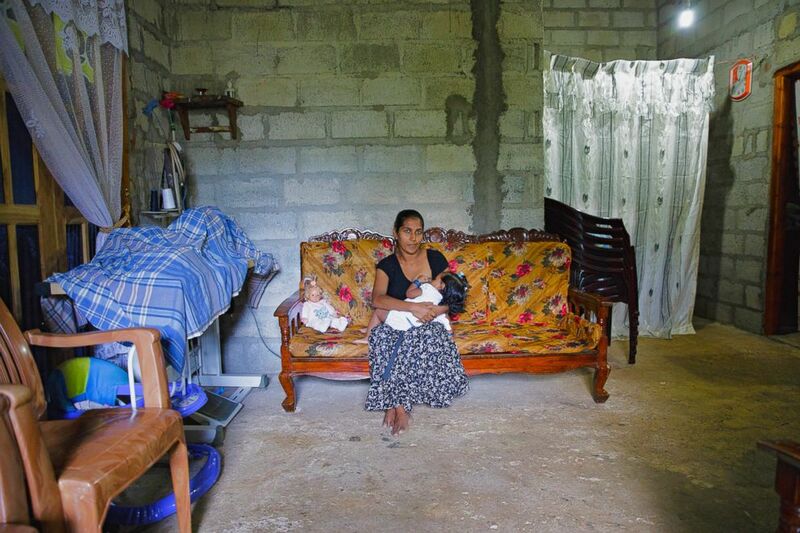 Here's what breastfeeding looks like in 14 countries around the world. For Breastfeeding Awareness Month a New York City-based photographer Tina Boyadjieva traveled to 18 different countries photographing mothers from all around the world. "Each mother and baby I encountered had her own individual and fascinating story. The mothers in the developing nations were nothing short of humbling,” Boyadjieva told ABC News. “I was with moms in favelas who provide for their children in the midst of poverty and lack of healthcare. The most fascinating experience for me, as someone who loves adventure, was being with the Maasai Tribe [in Kenya] for five days in Amboseli National Park at the feet of Mount Kilimanjaro." Boyadjieva went on the trip in partnership with Lansinoh, a breastfeeding company, for their Breastfeeding Around the World Campaign. (Tina Boyadjieva for Lansinoh) Gulush poses while breastfeeding in Turkey. Breastfeeding rates vary by country but two out of three infants worldwide are not breastfed for the recommended six months, according to a 2016 report by WHO (World Health Organization), UNICEF (The United Nations Children's Fund) and International Baby Food Action Network. A 2016 report in the medical journal The Lancet estimated that universal breastfeeding could prevent the deaths of 823,000 children each year. As part of global nutrition targets, countries who are part of the WHO have vowed to increase rates of exclusive breastfeeding in the first six months of life to at least 50 percent of mothers by 2025. Boyadjieva captured intimate and powerful portraits of women from around the world breastfeeding. Here are snapshots from 14 different countries -- with Boyadjieva's reflections. Glenda. This is Glenda's first baby, a baby boy. The image took place in Salvador de Bahia's main square. (Tina Boyadjieva for Lansinoh) Glenda poses while breastfeeding in Brazil. Tanxian. Before getting to Shanghai, Boyadjieva was told that breastfeeding, especially in public, was generally not accepted. She said she was very excited that Tanxian, a Chinese mom, was eager to to be photographed outdoors. They went to the Yu Gardens, a popular spot for locals and foreign tourists. Boyadjieva was quick, taking no more than five minutes to ensure Tanxian did not feel uncomfortable. Tanxian was clearly in love with her first baby, Boyadjieva noted. (Tina Boyadjieva for Lansinoh) Tanxian poses while breastfeeding in China. Maryluz. 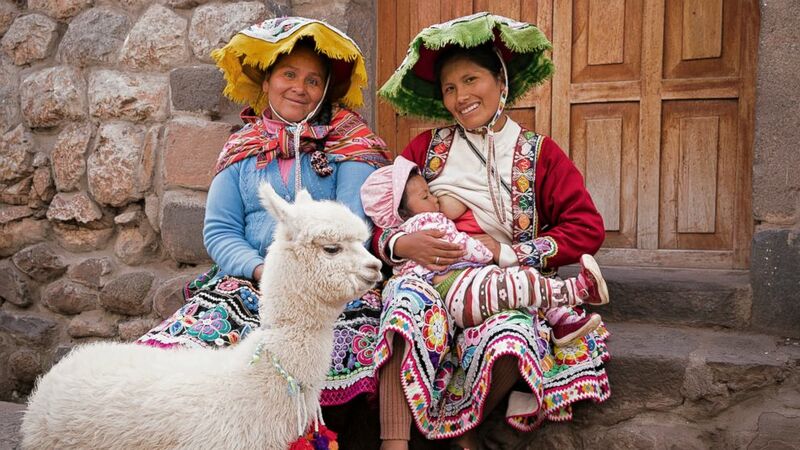 In Peru, women breastfeed their babies in the street, walking up the mountain, at the market or whenever necessary -- it is part of daily life. Boyadjieva met Maryluz, her aunt, baby and their llama as she walked around the first day in Peru. The women were happy to hear about the campaign and participate. Boyadjieva said: "It is impossible to travel to Cusco, Peru, and not notice the amazing embroidery and variety of outfits of the women from Urubamba valley. Although they are all from the same region, each village has its own style, design and colors." (Tina Boyadjieva for Lansinoh) Maryluz poses while breastfeeding in Peru. Celine. Boyadjieva spent a morning with Celine taking photos in front of the Eiffel Tower, Versaille and Hotel de Ville. They took the subway everywhere and had long conversations in broken French. At only 4 months old, Celine's daughter has undergone two open heart surgeries but still manages to spend most of her day smiling. (Tina Boyadjieva for Lansinoh) Celine poses while breastfeeding in France. Silvia. Silvia is from a neighborhood outside of Guatemala City, where many women make a living sewing beautiful hand-crocheted blouses and scarves and selling them to tourists. Traditional women's shirts have a slit in them to make it easier for mothers to breastfeed, Boyadjieva learned. Boyadjieva took her photo in the kitchen as it represents a central place in the home where women often spend time here, in a community without running water or electricity. The house where the family lived was small with a yard where fruits and vegetables were grown for home use. (Tina Boyadjieva for Lansinoh) Sylvia poses while breastfeeding in Guatemala. Loolei. Loolei is a member of the Maasai tribe. 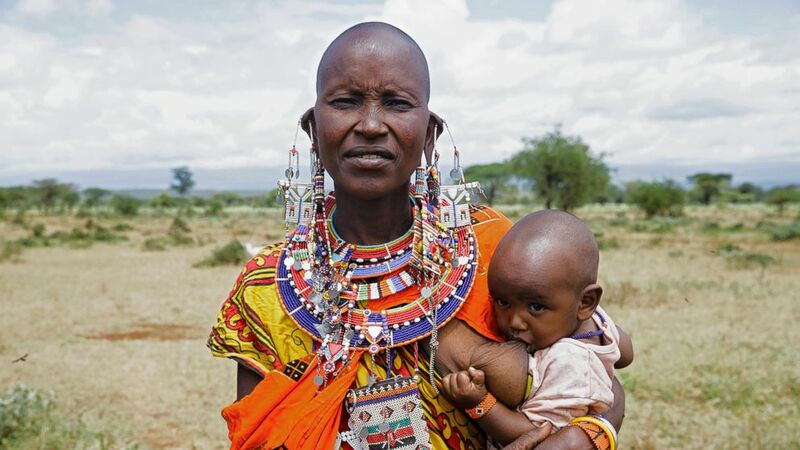 As a Maasai woman, her normal day includes making beaded necklaces, preparing food for the children and maintaining the house while her husband is with the cattle. She is her husband's second wife but said she has a wonderful relationship with her husband's other wife and children. A Maasai woman's main occupation is to make beautiful bead jewelry that's sold in markets, Boyadjieva said. "It was fascinating to see how women can get on with their daily activities, dressed in beautiful colors which beads hanging from their ears, ankles and wrists while carrying their babies on the backs or just popped on their hip breastfeeding," she added. Another highlight for Boyadjieva was "learning about Maasai women’s birth experience where all of the women in the village gather together and stay until the baby is born." (Tina Boyadjieva for Lansinoh) Loolei poses while breastfeeding in Kenya. Hilda. Boyadjieva spent the morning speaking with Hilda and her aunt, who sells textiles at the main square, until they trusted her enough to take their portraits. 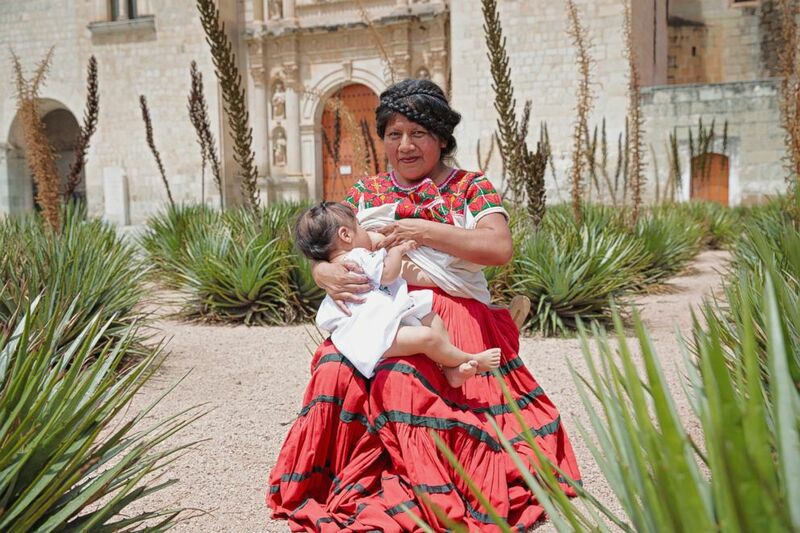 Boyadjieva wanted to capture the rich and amazing indigenous culture of Oaxaca so she shot Hilda in her traditional outfit in front of the main cathedral surrounded by the agave plants used to make the famous local mezcal. (Tina Boyadjieva for Lansinoh) Hilda poses while breastfeeding in Mexico. Eunice. Boyadjieva worked with Africa Food for Thought, an organization that provides food to poverty-stricken families, to gain safe access to townships known as favelas. A volunteer from AFFT took her through old mining towns -- now densely populated with families and churches -- on dirt roads and into neighborhoods of corrugated metal houses. Here she met Eunice, a young mom, who lives at home with her parents. Eunice said she wants to ensure her baby girl grows up safely amid the high levels of crime in her neighborhood. 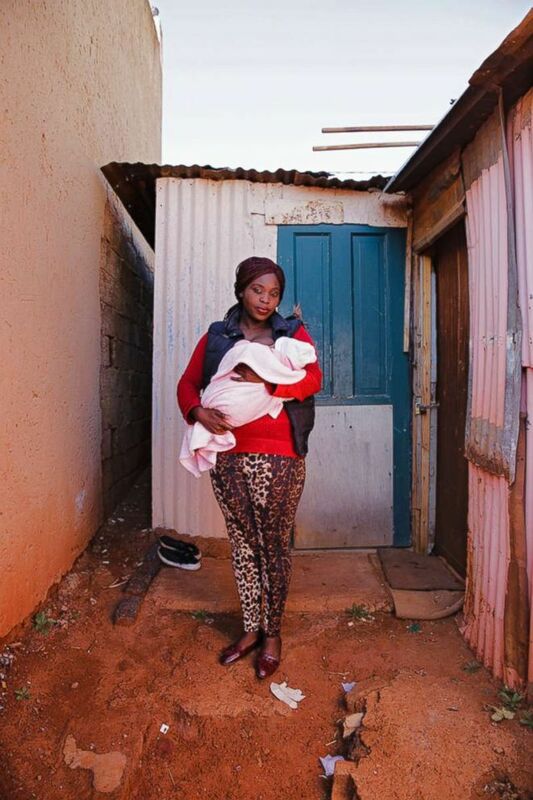 (Tina Boyadjieva for Lansinoh) Eunice poses while breastfeeding in South Africa. Boyadjieva found a group of breastfeeding moms in their late 30's and early 40's who are all breastfeeding advocates and supporters of causes that empower women. All six moms came to the location excited to participate and demonstrate the importance of women supporting each other . (Tina Boyadjieva for Lansinoh) A group of women pose while breastfeeding in Spain. W.H.N. W.H.N's husband is in the military and spends three to four months at a time away from home. She was excited that he was coming home to celebrate the baby’s 1st birthday. The classic Sri Lankan home has a small kitchen and a big yard with a shower, and where families grow crops. There were both Buddhist and Christian icons on display reflecting the local mix of religion after colonial times. (Tina Boyadjieva for Lansinoh) W.H.N poses while breastfeeding in Sri Lanka. Gulsah lives with her parents in a village close to the border of Bulgaria and Turkey. Her mom and four aunts also spent the day with Boyadjieva, talking to her on the “chardak” - the typical village house terrace. She learned about Bulgarian folklore, which references mothers who worked in the barley fields and would put their babies in swings from tree branches and sing songs to their babies while harvesting barley. Sylvia has a small shop selling corn - or whatever crop she can get - that day. 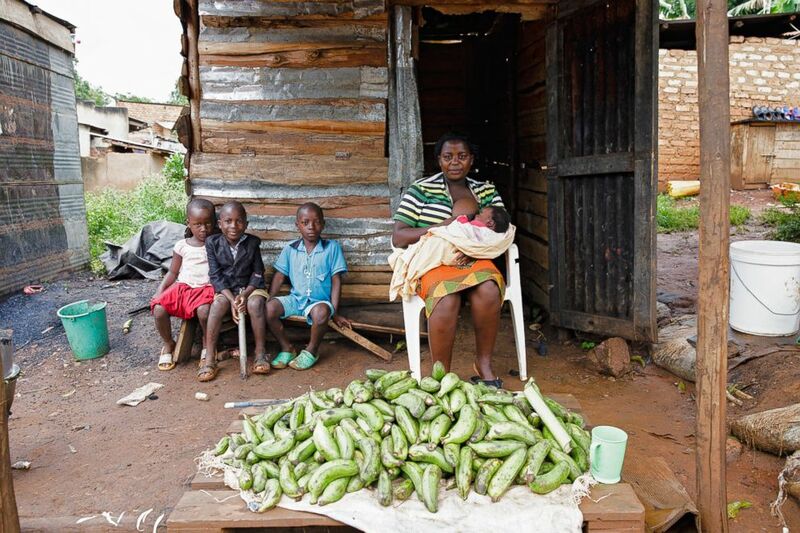 In Uganda, babies go everywhere with their mother - fields, the market, the shop, the bus. 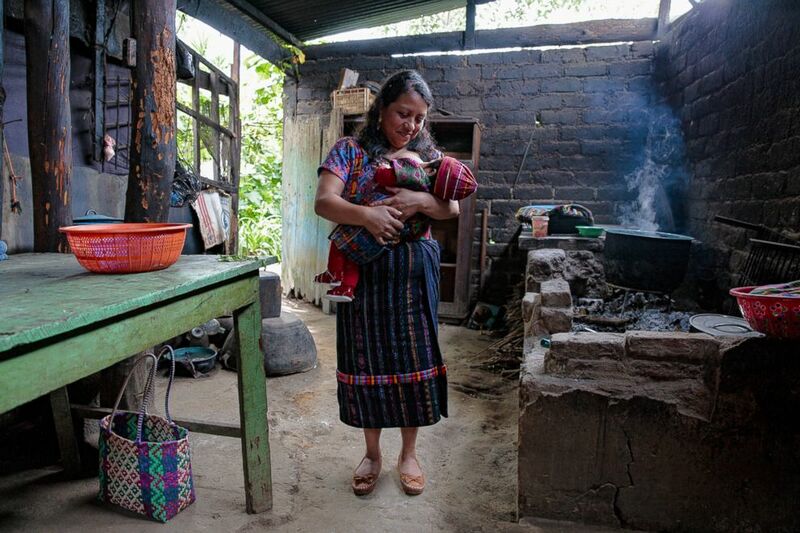 While Sylvia worked, her 2-month-old baby was inside the wood shed in a box wrapped up in blankets. Breastfeeding in public is part of their culture. Sylvia is happy she is healthy and can breastfeed her child. (Tina Boyadjieva for Lansinoh) Sylvia poses while breastfeeding in Uganda. Sophie is a bit uncomfortable breastfeeding in public but as long as her breast is covered she will feed her son anywhere. Sophie told Boyadjieva that she and her husband were proud to have their son model for the campaign. (Tina Boyadjieva for Lansinoh) Sophie poses while breastfeeding in United Kingdom. Nhung is a mother of three living in San Francisco. She said that breastfeeding gets easier with each child. As a child of immigrants, she feels that she is giving her children the life that her parents made possible. (Tina Boyadjieva for Lansinoh) Nhung poses while breastfeeding in San Francisco.